TheGoodAppleClub: Your bi-monthly newsletter is here! 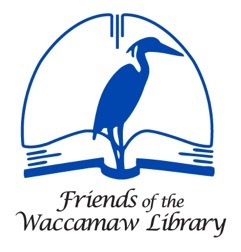 What's happening on the Waccamaw Neck ~ compliments of the Friends of Waccamaw Library! The Friends of Waccamaw Library's bi-monthly digital newsletter aims to let you know what's happening on the Waccamaw Neck and Georgetown (farther afield if it's library-related). This e-communication supplements the hard copy newsletter mailed quarterly and is sent to all Friends (whose e-dresses we have) and to all who ask to be added to the Constant Contact list. In addition to the programming developed by the library system and the Friends (in red), we will cover other opportunities for quality experiences, education and entertainment. The information is organized by date, so scroll down to the date you are seeking. If you are part of a group or organization with news to share, we welcome your announcement. Keep it short; just the facts. We cannot reproduce an elaborate pdf with graphics and photos. The key information needed includes: Title of event, Where held, When (date and time), BRIEF description, Benefit for (if applicable), Cost (if any), Contact (phone and email), Website (for more information). To be added to the e-mail list or to submit an announcement, please send your information directly to the e-newsletter editor Linda Ketron at: linda@classatpawleys.com. Kids & Families at Waccamaw Library - all programs free. Manners Club is held the first Saturday each month, providing basic etiquette and manners training in a fun and exciting environment for children 4-10 years old. Contact Connie Graham (Ms. Manners) at PawleysIslandMannersClub@gmail.com. Game on! We play a wide variety of family friendly board and card games at every branch, and always have a great time. Waccamaw Game Night, Tuesdays, 5:30-8:30 PM, free, ddennis@gtcounty.org. Art with the Myrtle Beach Art Museum. Ages 7 and up, 1st Wednesday each month, 3-4 PM. Canine Angels. Reading has gone to the dogs! Check out this link to see the benefits to children of reading to attentive pooches: www.medicalnewstoday.com/articles/186708. All ages, 2nd & 4th Wednesday each month, 3-4 PM. LEGO Free Build. All ages, Fridays after school. Minecraft Club. Come share the worlds you've created! All ages, Fridays after school. Adults at Waccamaw Library - all programs free. Tidelands Camera Club meets on the first Monday each month, 9-10:30 AM. Membership required. Technology Club meets on the second Monday each month at 9:30 AM to discuss advances. Waccamaw Genealogy Club meets on the third Monday each month, 9-11:30 AM. Knitting Group meets Mondays, 1-3 PM to knit and crochet with company and share patterns and techniques. Mah Jongg Club meets Tuesdays, 1-3 PM, bring your set and current card. Photo Interest Group meets Fridays, 9:30 AM. To honor the memory of FOWL past president Kathy Gramet, who with gentle grace led the Friends through the construction phase of the new library, though sadly passing before its completion, we are requesting donations to purchase "Terrific Tactile Trunks." These boxes of shapes and textures can be checked out by parents of special needs children to aid in their development and vocabulary. Donations can be made to Friends of Waccamaw Library, PO Box 1152, Pawleys Island, SC 29585 (or dropped at the library desk). Sharon Turner is Waccamaw Library's Artist of the Month for April. Sharon, a native of Georgetown, grew up loving the colors and beauty of her Southern heritage and pulls on these resources for her paintings. Primarily a watercolor artist, a turning point for her art career occurred when she won an award for and sold a painting. The realization that her work had merit that others appreciated motivated Sharon. Painting primarily from her own photographs, Sharon's work continues to evolve into more of the impressionistic style she has studied and always admired. Using color, composition and brush stroke, Sharon's work has been described as fresh and full of emotion. For more information, please email Steele Bremner at sbremner@gtcounty.org. Gary Lucas is Waccamaw Library's Photographer of the Month for April. Lucas has been photographing people, places, pets and wildlife since 1970. His ownership of Lucasgroup Advertising (before his semi-retirement in Pawleys Island) led to an opportunity to photograph the Miami Dolphins, beginning in 1972 when the team had their Perfect Season. Through his small ad shop, he shot for clients including Pepsi-Cola and RCA Records, plus a long list of local, regional and national homebuilders, restaurant chains and home health care companies. Today he focuses on family, children and pet photography along our coastal beaches, as well as a passionate quest to capture Mother Nature's most awe-inspiring scenes and wildlife. Lucas is an especially appropriate artist to grace the library walls, as he is also the author of five mystery novels and two collections of short stories and poetry. You can check out his work at local bookstores, amazon.com, or lucastories.com. For more information about the exhibit, please email Steele Bremner at sbremner@gtcounty.org. See May 15 for the "Sister" Peterkin oyster roast replacement event! We're having a birthday party at "Sister's Heaven"! This new event will be held Friday, April 29 (10 AM-4 PM) and Saturday, April 30 (10 AM-noon) at the Waccamaw Library. Kathy Diehl is recruiting volunteers to sort books for the Spring Sale which will focus on prolific fiction writers (e.g., James Patterson, Danielle Steel, Clive Cussler, John Grisham, Nora Roberts, etc. ), Paperbacks, Non-Fiction books by Southern writers and/or focused on the South, and Books on Tape/CDs/DVDs. Call the Friends Center (843-545-3387) if you can help. 9:30 AM-8 PM - Brookgreen Gardens "Open Late Till 8." After a day on the golf course or on the beach, see the beauty of Brookgreen's spring flowers when the gardens remain open. Gift shop and food service are available. Ride with an interpreter on a Graveyard Trekker Excursion and explore some of the cemeteries on the 9,000 acre property of Brookgreen. The excursions are available on Sun., Tues. and Thurs. at 5:30 PM and cost $15 per person in addition to garden admission. Daily, 9:30 AM-8 PM, 843-235-6000. April 1-Oct. 31 - Whispering Wings Butterfly Experience at Brookgreen's Butterfly House. This seasonal exhibit features a lush garden filled with tropical plants where hundreds of butterflies soar through the air. Monarch, Zebra Longwing, Polydamas Swallowtails, Pipevine Swallowtails, Spicebush Swallowtails, Julias, Buckeyes, Queens, Painted Lady, and American Lady are just a few of the species that call Whispering Wings home. We will add dozens of other species throughout the summer and fall. Whispering Wings contains a pupae emergence room where visitors may observe the transformation from chrysalis to adult butterflies. Interpretive signs throughout the exhibit and benches provide a restful place to watch their delicate beauty in flight. Daily, 10:30 AM-4:30 PM, adults $3, children $2 for a 30-minute timed visit, in addition to garden admission, 843-235-6000. 1:30-4 PM - Learn to Throw a Cast Net.Boat season is here and if you have ever wondered how to throw a cast net, this is your chance! Come to Hobcaw Barony and learn this fool proof way of opening the net with ease after only a few practice casts. You'll never miss the bait again and you will be welcomed on the bow of any boat once you've mastered the art of the throw. After practicing on land, participants will be taken to Clambank Creek to test their skills. Open for all ages. Bring your own cast net. $20, reservations required, 843-546-4623, HobcawBarony.org. 9:30 AM-5 PM - Plantacular Sale at Brookgreen Gardens. One of the most popular events all year, the plantacular sale is a one-stop shopping experience for high-quality plants grown in Brookgreen's greenhouses. Horticulture staff and volunteers are on-hand to give expert advice for all your gardening needs. Come early for the best selection. Check website later for the list of plants for sale. Free with garden admission, 843-235-6000. 9 AM-4 PM - Spring Planting Day at L.W. Paul Living History Farm (2279 Harris Shortcut Rd., Conway). Enjoy a day of planting and plowing on a one horse family farm, Saturday April 2, 2016 from 9:00 am until 4:00 pm. The L. W. Paul Living History Farm is gearing up the mule to set tobacco and plant corn for the summer. Join the Farm staff as they re-create old days on the family farm. Traditional farm tools and techniques are used to work and demonstrate. The public is invited to try their hand at setting tobacco with hand setters and cultivating crops. A variety of activities and crafts will be available for all ages. Demonstrations planned for the day include setting tobacco plants, planting a spring garden, wood working, making lye soap, grinding grits and meal, blacksmithing, cooking on a wood stove, butter making, and children's games will be on hand. Food, snacks and gifts are available for purchase in the visitor's center. Re-create the past years between 1900-1955 and embrace an Horry County, one horse family farm lifestyle. Find a memory of your own, or make a new memory with the family. This event is free and open to the public. For further information, please contact the L.W. Paul Living History Farm at (843) 365-3596, e-mail hcgmuseum@horrycounty.org, or call the Horry County Museum at (843) 915-5320. For a full listing of programs, visit our website at www.horrycountymuseum.org. 10 AM-3 PM - Bellefield Garden Lecture Series. Held at the Bellefield Plantation greenhouse on Hobcaw Barony, we will have a selection of plants for purchase that no garden should be without. Our main focus is on butterfly, bee and hummingbird attractants, natives and heirloom edibles. The Bellefield house will be open from 10-3. We will also be having educational lectures. $10, reservations required, 843-546-4623, HobcawBarony.org. 4 PM - Hobnob at Hobcaw 2016. A benefit in support of the Waccamaw Riverkeeper program at Kimbel Lodge/Pond Shelter. Live music by Sawgrass, oysters (and other tasty Southern fare), beer and wine. Tickets $25 (Winyah Rivers Foundation members), $30 (non-members), 843-349-4007 or riverkeeper@winyahrivers.org. 7-8:30 PM - Coastal Reaction Band to Rock the Waccamaw Library. Just after the doors close on Saturday to book borrowers, the Coastal Reaction Band will fire up a toe tapping live performance that includes favorite selections of rock, soul, funk, R&B and beach music. The free concert is sponsored by the Friends of the Waccamaw Library. 3 PM - Murrells Inlet Community Theater to perform at the Waccamaw Library. MICT's traveling troupe Second Stage Repertory will grace the Waccamaw Library with two more riveting variety shows this spring. The shows, grouped under the moniker "Mike's Meanderings," will feature mesmerizing monologues, instrumental interludes, poetry readings and more, by performers Mike Bivona, Kathy Kenney, Pat Dunning, Heidi McCarty and Beverly Kennedy. The show is free of charge. Reservations are not required, but are encouraged. Also offered Sunday, April 17. Please email sbremner@gtcounty.org. 11:30 AM-1 PM - Winyah Group Sierra Club meeting at Applewood House of Pancakes in Litchfield. 1 PM - Gullah Program at Brookgreen Gardens. Ron Daise, Vice-president for Creative Education and Gullah descendant, will present an entertaining and informative program about the culture, food, language, and history of the Gullah Geechee people in the Wall Lowcountry Center Auditorium. Also offered April 13, 20 and 27. Free with garden admission, 843-235-6000. 10 AM - First Thursdays Speakers Series at Waccamaw Library presents Tom Poland's "Classic Carolina Road Trips," based on his book by the same name, which will provide a photo-illustrated, armchair sojourn down the backroads of our state. Travel with him on this statewide look at some of South Carolina's most interesting places you'll surely want to add to your own "must-visit" list. Sponsored by FOWL and South Carolina Humanities. Free with refreshments, thefowl.org. 1:30-4:30 PM - Behind the Scenes Tour of Hobcaw Barony. Join us for an expanded tour of the property with opportunities to see and experience more than what is offered on the Introductory Tour. The program includes stops at the North Inlet salt marsh, the grounds of Bellefield Plantation, Friendfield Village, and the main floor of Hobcaw House, giving participants a chance to spend more time at each location. Also offered April 14 & 28. $30, reservations required, 843-546-4623, HobcawBarony.org. 3-4 PM - Litchfield Tea & Poetry at Waccamaw Library. The finale of the tenth year of the Tea & Poetry Series, featuring talented poets of the region, co-sponsored by the Waccamaw Neck Branch Library and The Poetry Society of South Carolina, presents Brookgreen Gardens: Through the Seasons in Images and Words. Join the photographer (Anne Swift Malarich) and editors (Linda Ketron, Libby Bernardin and Susan Laughter Meyers) and a number of the contributing poets (e.g., Lee Brockington, Bill Cepps, Ron Daise, Millie Doud, Sally Hare, Sarah Posey, Annie Pott, Nancy Seitz, Terry Reilly, Larry Reiter, Joan Wood) to celebrate this collaborative creation. From more than 100,000 images captured over two decades, 140 favorites were chosen. Then Brookgreen Gardens staff and volunteers and select community poets were invited to pick their favorites among them and to write poetic "love letters." Books will be available to purchase ($39.50). The event is free with refreshments, bardowl2@aol.com or libbypoet@gmail.com. 6-9 PM - Georgetown Business Association presents free Live Music Concerts at Francis Marion Park (732 Front St.): Thurs., April 7, 6-9 PM, celebrity country music artist Josh Thompson; Fri., April 8, 6-9 PM, Jason Michael Carroll; Sat., April 9, 5:30-9 PM, The Embers. General admission is free, VIP section available for show sponsors includes table service, seating and a meet & greet with the celebrity artist along with advertising, merchandising and more, GeorgetownSeaport.com. Explore French Santee. Support the McClellanville Arts Council and explore French Santee. A weekend of exciting activities centered on history, nature, and art. For a flat $50 fee, you can participate in all of them! Fri., April 8, 7 PM, a presentation at the McClellanville Arts Center on the History of French Santee; Sat., April 9, 9:30 and 11 AM and 2 PM, Photography Walking Tour at Hampton Plantation State Park; Sat., April 9, 12:30 PM, Tour of Mrs. Sue Alston's home site; Sat., April 9, 1:30 PM, Watercolor with Vida Miller; Sun., April 10, 1:30 PM, Paddle Wambaw Creek and explore a unique part of French Santee that is now part of the Francis Marion National Forest. This trip is led by expert guides and sponsored by Nature Adventures Outfitters. Single kayaks, tandem kayaks, and canoes are available. Call 843-568-3222 to register. For more information, 843-887-3157 or McclellanvilleArtsCouncil.com. 11 AM-2 PM - Second Saturdays with Sweetgrass Basketmaking at Kaminski House Museum. McClellanville sweetgrass craftswomen Barbara McCormick and Audrey Manigault on the porch. 843-546-7706. 2:30-4:30 PM - Friendfield Village. Introductory Tours pass through this African American village, once home to 100 slaves and lived in by black employees until 1952. Take an extended tour of Friendfield, traveling by bus, but being guided on foot through the cabins and the 19th century church. Hobcaw Barony has a unique chance to interpret history at the site, as gleaned from documents, photographs, oral histories and also visits from former residents. $20, reservations required, 843-546-4623, HobcawBarony.org. Winyah Bay Heritage Festival at Carroll Ashmore Campbell Marine Complex, Georgetown. A celebration of art, hunting, fishing and conservation to benefit Georgetown County Museum. Among the events scheduled are Dock Dogs Competitions, S.C. Duck Calling Contest, Birds of Prey Demonstrations, Youth Duck Calling Clinics, Virtual Fishing Simulator, Children's Decoy Painting, Art & Conservation Exhibits. Visit WinyahBayFestival.org. 9:30 AM-1:30 PM - Hobcaw Habitats Photography Program. Join our Hobcaw Barony photography crew during a program that features different habitats in search of plants, flowers and wildlife. Some areas included are the salt marsh, forest and pond at Bellefield Plantation. Topics discussed will be aperture, ISO, shutter speed, lighting, depth of field, lens choice and special tips. Bus transportation will be provided, but come prepared to walk and be in the elements. Bring water and snacks if desired. Space is limited to 14 participants. $45, reservations required, 843-546-4623, HobcawBarony.org. Noon-1 PM - Keeping It Simple: Mindfulness in Everyday Life with Lisa Rosof, facilitator. Part IV - Having Compassion for Self & Others. These consecutive teachings help us to be less reactive, more compassionate and gentler with ourselves and others, less judgmental, less critical and more understanding of our own and others' suffering. For course information and questions, contact Lisa Rosof, 843-504-1057 or lcrosof@gmail.com. Purchase required text ($19.95) before first class at www.facesconferences.com (also available through Amazon and on Kindle). 8 weeks, $160, register with CLASS, 843-235-9600 or ClassAtPawleys.com. 9:30 AM - Low Country Herb Society (LCHS) at Waccamaw Library. Kris Reynolds, partner at the Inlet Culinary Garden in Murrells Inlet, will present ways to invite beneficial insects into your garden instead of using chemical compounds that destroy not only the bad but the good bugs, as well. Membership in LCHS is open to all, and no experience is necessary! A "Meet and Greet" social time to welcome guests and members is held prior to the meeting with refreshments provided by LCHS members. LCHS meets from September through May and the annual dues are $20 with a quarterly newsletter included. For more information, visit lcherbsociety.info and "like" us on Facebook. 5:30 PM - Scanning 101 at Georgetown Library. From equipment to dots-per-inch, learn everything you need to know about how to scan your family photos. Participants may bring up to three unframed photos and a flash drive to learn hands-on how to use a scanner and how to get the best quality scans for their family treasures. Class size is limited to 10. Registration is required. Free, 843-545-3316. 1 PM - Gullah Program at Brookgreen Gardens. See April 6 entry for details; also offered April 20 and 27. Free with garden admission, 843-235-6000 or Brookgreen.org. 9 AM-1 PM - North Inlet Paddle. Join the North Inlet-Winyah Bay National Estuarine Research Reserve and Surf the Earth for a naturalist-guided tour through the creeks of North Inlet. The program includes instruction in basic kayaking, a natural history overview, and educational highlights of the North Inlet ecosystem. Wear sturdy shoes, bring water, snack, and camera/binoculars (if desired). Also offered May 16, June 14 and July 13. $50/person; weather permitting; limited to 6 participants; register at 843-904-9016 or -9017. 1:30-4:30 PM - Behind the Scenes Tour of Hobcaw Barony. See April 7 entry for details; also offered April 28. $30, reservations required, 843-546-4623, HobcawBarony.org. 6-9 PM - Georgetown Business Association presents Karaoke with Jessie Taylor at Francis Marion Park (732 Front St.). Also offered May 12 and June 9. Free, GeorgetownSeaport.com. 11 AM-1 PM - The Moveable Feast: Bo Petersen (Washing Our Hands in the Cloud) at Hot Fish Club, Murrells Inlet. A masterfully crafted reflection on the Civil War, emancipation, Jim Crow, and the civil rights movement in the personal story of how these events affected one man's life in a specific South Carolina locale. Through conversations with Joe Williams, his family, and acquaintances, Petersen merges the Williams family history back to Joe's great-great-grandfather Scipio Williams, with the lives and fortunes of four generations of South Carolinians - black and white. In gathering what Petersen describes as a collection of front porch stories, he also writes a history of what matters most to this family and this locale. The resulting narrative is surprising, unconventional, and ultimately true for all families in all places. Proceeds of this Moveable Feast will be donated to the Friends of Waccamaw Library for the naming of the Chandler/Peterkin Room, in honor and appreciation of the families' contributions to the cultural, literary, civil rights and environmental heritage of the Waccamaw Neck. $25, 843-235-9600 or ClassAtPawleys.com. 6:30-9:30 PM - Nashville Songwriters in the Round at Winyah Indigo Society Hall (509 Prince St., Georgetown). Join award-winning songwriters performing their music in a unique setting and share a rare insider view of the stories and inspirations behind the hit songs they've written for music stars Kenny Chesney, George Strait, Darius Rucker, Lee Brice and Eric Church. $150, HealthyLearners.com. 10 AM-Noon - Swamp Fox Players Auditions for And The Winner Is, directed by Kathy Anderson at the Strand Theater (710 Front St., Georgetown). Audition material provided for cast needed: Tyler Johnes (male, mid-40's); Seamus (male, late 60's/70ish, impish, Irish bartender); Teddy LaPetite (male, late 30's/40ish French); Kyle Morgan (male, late 20's); Sheri (female, late 30's); Serenity (female, early 20's bombshell). And the Winner Is by Mitch Albom, tells the comic story of Tyler Johnes, a self-obsessed movie story, who is finally nominated for an Oscar, then dies the night before the awards. Outraged at his bad luck and determined to know if he wins (even though he's dead), he bargains with a heavenly gatekeeper to return to earth for the big night. Along the way, he drags his agent, his acting rival, his bombshell girlfriend and his ex-wife into the journey, in a wildly twisting tale of Hollywood, the afterlife, and how we are judged. Performance dates: Oct. 28 - Nov. 13, 2016. Auditions also Tuesday, April 19, 6-8 PM. If you have questions, contact nodrek@gmail.com or 843-527-1250. 7 PM - Astronomy for Everyone: Size & Scale of the Universe. Waccamaw Library hosts a star-filled workshop for all ages, inviting everyone to come explore the final frontier, view celestial wonders like the rings of Saturn, the craters of the moon and other jewels of the night sky. On Saturday, 7 PM, the library will host "Astronomy for Everyone: Size and Scale of the Universe," a free, hands-on program that begins inside, enjoying incomparable photos of our universe, and ends outside, peering through a powerful telescope into the wonders of the cosmos. The program is presented by astronomer and former NASA consultant Kevin Manning, who not only travels the country bringing the stars to libraries and schools, but also worked with the Chandra X-Ray Observatory (launched on the space shuttle) with the Harvard-Smithsonian Center for Astrophysics and other places like Brookhaven National Laboratory. Manning launched his "Star Tour" series to help make science accessible and exciting for all ages. The program is sponsored by the Waccamaw Library and Friends of the Waccamaw Library. Registration is not required, but you are encouraged to email to help gauge attendance: sbremner@gtcounty.org. 2-5:30 PM - Miss Ruby's Kids Garden Party at the Kaminski House Museum, emceed by Kevin Jayroe. An afternoon of fun and enchantment with delicious food and beverages, soft background music, unique and stunning auction items, and tours of the Kaminski House. $100, 843-436-7197 or MissRubysKids.net. 3 PM - Mike's Meanderings at Waccamaw Library. See April 3 entry for details. Sun., 3 PM, free, sbremner@gtcounty.org. 4:30 PM - Brookgreen Medal - Public Lecture at the Welcome Center Conference Room. The public is invite to hear Lawrence Noble give a talk about his creation the 2016 medal entitled "Cicada Days, Firefly Nights." This year's medal is especially beautiful and, with the new release of the current "Star Wars" movie, Lawrence Noble is an exciting person to meet. He has worked for George Lucas (both sculpture and graphic design) and recently won a major award from the National Sculpture Society for his sculpture at Lucas Films Headquarters on the grounds of The Presidio in San Francisco. Free with garden admission, 843-235-6000. 5-9 PM - Beethoven, Blue Jeans & BBQ at Inlet Affair in Murrells Inlet. Come join us in your favorite pair of blue jeans for music provided by the Legendary DAVE O. Enter yourself in the raffle for a chance to win a raffle basket. Proceeds benefit the Long Bay Symphony and the Long Bay Symphony Youth Orchestra. Menu: Pulled Pork BBQ with rolls, Chicken Bog, Mac & Cheese, Coleslaw, Baked Beans, Banana Pudding, and Sweet Tea. $50, 843-448-8379 or LongBaySymphony.com. 6-8 PM - Swamp Fox Players Auditions for And The Winner Is, directed by Kathy Anderson at the Strand Theater (710 Front St., Georgetown). See April 16 entry for details. If you have questions, contact nodrek@gmail.com or 843-527-1250. 1 PM - Gullah Program at Brookgreen Gardens. See April 6 entry for details; also offered April 27. Free with garden admission, 843-235-6000. 1-5 PM - Shorescaping: Planted Shorelines for Your Pond. This workshop will present information about what the nature and benefits of shorescaping. It will include information on shorescaping design, installation and maintenance, as well as how to select proper plants for your pond shoreline. The workshop will include a hands-on installation of a shoreline planting project at the Carolina Forest Recreation Center, Myrtle Beach. This program is designed for anyone who owns, manages, installs, or maintains stormwater ponds, and those interested in learning more about the design, installation and maintenance of this beneficial, pond landscaping practice. $15, limited to 20 participants, 843-904-9034. 10-11 AM - Coffee & Climate. Drop by the Pawleys Island Bakery for a cup of coffee and an engaging discussion about climate issues. Want to know more about something you heard in the news? Are there climate questions you have been wanting to ask? We will present a brief overview of a current climate issue, followed by an open discussion among our community members about what the topic means to you. Also offered May 19 and June 16. Free, for more information, visit http://www.northinlet.sc.edu/climate.html. 1:30-3:30 PM - Bellefield Plantation Tour. Tour the grounds and structures of Belle W. Baruch's 1937 plantation home, as well as her beloved horse stables. This expanded tour goes beyond the Introductory Tour's visit to Bellefield Plantation. $20, reservations required, 843-546-4623, HobcawBarony.org. 6-9 PM - Georgetown Business Association presents The Fourclosures in concert at Francis Marion Park (732 Front St.). Free, GeorgetownSeaport.com. Friday, 6-9 PM and Saturday, 9:30 AM-4:30 PM - Hobcaw Barony Plantation Sportsman Series: Santee Delta Connection. Celebrating our plantation history, participants enjoy a two-part program featuring a dinner and lecture, followed the next day by an outing to exclusive sites and plantations and conversations with special hosts. An evening dinner and lecture at Hobcaw House sets the stage for a natural history outing to the land near the mouth of the Santee River, once the most powerful river east of the Mississippi. Once dominated by rice cultivation, the delta's marshes soon became an attraction to wintering millionaires, both from the South and the North, who formed a hunt club and helped preserve the most of the largest river delta on the east coast. Our field trip with host Jim Lee, of SC Department of Natural Resources, to the state-owned Santee Coastal Reserve, focuses on the ecology and habitats for wildlife. Hobcaw Barony staff also provides interpretation on the Native American Santee tribe, the plantations of St. James Santee Parish, and today's state operation as the Santee Delta Wildlife Management Area. $150, reservations required, 843-546-4623, HobcawBarony.org. 9:30 AM-Noon - Spring Wildflowers and Insects. Take a walk through maritime, upland forest, and wetland habitats to see our spring wildflowers, butterflies, dragonflies and more at Hobcaw Barony. National Estuarine Research Reserve staff will help you identify common species that are present in the spring. Wear comfortable walking shoes, bring insect repellant, and cameras/binoculars (if desired). Weather permitting, limited to 14, registration required. Free, 843-904-9016 or -9017. 11 AM-1 PM - The Moveable Feast: Kristy Woodson Harvey (Lies and Other Acts of Love) at Ocean One, Litchfield. Her first novel, Dear Carolina, was praised as "Southern fiction at its best." Her second is about what it really means to tell the truth . . . After sixty years of marriage and five daughters, Lynn "Lovey" White knows that all of us, from time to time, need to use our little white lies. $25, 843-235-9600. 9 AM-Noon - Waterway Clean-Up 2016 Kick-Off Event hosted by the Waccamaw Riverkeeper® at the Conway Marina. This one-day volunteer event is part of a community wide clean-up of our local waterways. Meet at the Conway Marina located at 4 Elm Street in downtown Conway. Bring your own water and snacks. Free kayaks and canoes will be available (first come, first served). You may also bring your own boat (boat launch fee will be waived). Not interested in getting out on the water? No problem! Helping hands are also needed to clean up on land along the riverbank, parking lot and playground. Additional clean-ups through May 7, sign up your church group, school club, earth day celebration or single volunteer. Free, register at WinyahRivers.org. 7-11 PM - 10th Annual Rotary Shag Festival in Historic Georgetown (100 King St.). Shag the night away to the sounds of Heart n' Soul, beginning at 6 PM with shag lessons. Food and drink available. $20 (advance), $25 (at the door), GeorgetownLunchRotary.org. 9 AM-Noon - Bike the Neck welcomes Adopt-a-Path clean-up crews throughout Murrells Inlet, Litchfield and Pawleys Island. If you use the Waccamaw Neck Bikeway, join your neighbors and come out to pick up litter and clear the path. If you live on the route, bag it, broom it or blow it. Four command posts will distribute safety vests, trash bags and gloves from 9 AM-Noon, at Morse Landing Park (Murrells Inlet), Trace Drive at the south entrance to Huntington Beach State Park (North Litchfield), Waccamaw Elementary School (Waverly Road, Pawleys Island) and Pawleys Island General Store parking lot (Ocean Highway, Pawleys Island). To link up with other interested citizens, call Bike the Neck at 843-520-6879 or linda@classatpawleys.com. 9:45 AM-3 PM - 25th Annual Spring Tide - A Day for the Inlet. Twenty-four years and going strong, Spring Tide is South Carolina's biggest and longest-running one-day community clean-up. Join in to clean up the creek and streets of Murrells Inlet. The day begins with an invocation at 9:45 AM at Morse Park Landing (next to the Hot Fish Club). Volunteers check in at the Hot Fish Club to receive street assignments for clean-up. Workers head out at 10 AM to start picking up the trash. Everyone is invited back to the Hot Fish Club at 1 PM for the "Best Damn Chowder Cook-off," light-hearted festivities and live music to celebrate our hard work. More than 15 restaurant chowders will be available and the chowder is free to all our workers. Bring your boats, boots, bug spray, glove and your love of the Inlet. Free, 357-2007. 1 PM - Gullah Program at Brookgreen Gardens. See April 6 entry for details. Free with garden admission, 843-235-6000. 1:30-4:30 - Behind the Scenes Tour of Hobcaw Barony. See April 7 entry for details. $30, reservations required, 843-546-4623, HobcawBarony.org. 6:30 PM - 8th Annual Celebrate Poetry Night at Waccamaw Library. Come hear selections from the best teen poetry on the beach! This glittering evening is the culmination of the Waccamaw Friends of the Library Poetry Contest - a panel will select five winners on site. Free, sbremner@gtcounty.org. 10 AM - FOWL Spring Book Sale at Waccamaw Library. Join the Friends of Waccamaw Library for a spring cleaning sale focused on prolific fiction writers (e.g., James Patterson, Danielle Steel, Clive Cussler, John Grisham, Nora Roberts, etc. ), paperbacks, non-fiction books by Southern writers and/or focused on the South, and books on tape/CDs/DVDs. Unbelievable prices (Hardcovers, $1 each or 2 for $1.50; Trade Paperbacks, $.75; Paperbacks, $.50 each or 3 for $1; Children's Books, $.20 and up; Books on Tae/CD, $2 and up; CDs/DVDs, $1 and up!! Fri., 10 AM-4 PM, and Sat., 10 AM-Noon, free to attend, 843-545-3387 or TheFowl.org. 11 AM-1 PM - The Moveable Feast: Celeste Fletcher McHale (The Secret to the Hummingbird Cake) at Pine Lakes Country Club, Myrtle Beach. In the South you always say "yes, ma'am" and "no, ma'am." You know everybody's business. Football is a lifestyle not a pastime. Food - especially dessert - is almost a religious experience. And you protect your friends as fiercely as you protect your family - even if the threat is something you cannot see. In this spot-on Southern novel brimming with wit and authenticity, you'll laugh alongside lifelong friends, navigate the sometimes rocky path of marriage, and roll through the outrageous curveballs that life sometimes throws . . . from devastating pain to absolute joy. $25, 843-235-9600. Noon-3 PM - Pawleys Island Festival of Music & Art presents the third annual Low Country Garden Party at Whitehall Plantation on Winyah Bay, featuring a gem dig, live painting, a raffle, live auction and more. $85, PawleysMusic.com. 8:30 AM-5:30 PM - Georgetown Business Association presents Blessing of the Fleet & Shrimp Cook off at Francis Marion Park (732 Front St.) and Harborwalk, Free, GeorgetownSeaport.com. 10 AM-6 PM - My Sister's Books will be celebrating Independent Bookstore Day with free refreshments, a free gift with purchase and several authors signing their books, MySistersBooks.com. 3-5 PM - CLASS Productions presents Zydeco with Ceasar (yes, that's the correct spelling!) in concert at Kimbel Lodge, Hobcaw Barony. Born Donald Ceasar in the bayou of Louisiana, heart of Creole and Cajun country, where his grandfather, Alphonse "Boisec" Ardoin, was a pioneer in the Zydeco music movement, Ceasar has been entertaining audiences of all kinds since the age of 6 playing drums for "Boisec's" band. Since then, he has evolved into a consummate, multi-talented act performing on drums, harmonica, keyboards along with singing lead vocals and exuberant dancing which will leave you breathless! Check out his viral YouTube dance tribute to James Brown! Snacks, iced tea, ice, openers, cups and napkins provided. Anything else you'd like, BYOB. Tickets are limited, $25 per person, available at Art Works in the Litchfield Exchange, or by calling 843-235-9600 or linda@classatpawleys.com. Laissez les bon temps roulez! May 7 - Tickets are on sale NOW for Brookgreen Gardens' 2016 Gala, Masquerade at the Muses. The annual fundraising event is a rare opportunity to see the gardens "after-hours" on Saturday, May 7, from 5 to 9 PM. The annual event, renowned in the Lowcountry, is refreshed each year with a new theme and location with in the gardens, but its goal remains the same: to provide the necessary funding to increase the wonder of the cultural jewel that is Brookgreen Gardens. This year's masquerade-themed, black-tie-optional, event will be held at the Fountain of the Muses Garden. Guests will enjoy valet parking, cocktails and gourmet nibbles, live music from Paperwork, a fine silent auction, and a large-screen viewing of the Kentucky Derby. Tickets are $175 per person or $300 per patron ticket which includes preferred designated seating. A portion of each ticket is tax-deductible. Events have sold out in previous years so attendees are advised to buy early. You may purchase tickets by calling 843-235-6018 or go online at www.brookgreen.org. Updates and auction items will be on Facebook and Instagram. Follow with #BrookgreenGala or look for "Friends of Brookgreen" on Facebook for the latest information. May 14 - Calling all artists and artisans to participate in a day-long festival to benefit Alzheimer's Research. Pat David is signing up painters, photographers, craftsmen and authors for the arts and herb festival at the Grapefull Sisters Vineyard (95 Dot's Drive, Tabor City, NC 28463). Tables (bring your own) are $25 to reserve (this fee is your donation to the fundraiser). All sales proceeds retained by the artists. If you'd like to participate, call Pat at 843-650-2244. May 15 - Tickets are on sale NOW for the Genevieve "Sister" Chandler Peterkin Birthday Party. This fundraiser (replacing the oyster roast) will help name one of the small meeting rooms at the Waccamaw Library for the Chandler/Peterkin families, in honor and appreciation of their contributions to the cultural, literary, civil rights and environmental heritage of the Waccamaw Neck. Join Lee Brockington, members of the Chandler family, and Billy Baldwin for an afternoon of memory sharing, storytelling, poetry reading, song singing, book signing, and creek-inspired noshing at Inlet Affairs from 3-5 PM. Tickets are $30 per person and must be reserved through Art Works/CLASS (843-235-9600 or ClassAtPawleys.com), although your check can be made payable to FOWL (Friends of Waccamaw Library). Space is limited! Check out this new website, created and maintained by Murrells Inlet resident John Morken, to keep you informed about all of the cultural events on the Grand Strand. Dedicated to making it easy to know about all the Fine Arts events, it strips away pop culture and tourist attractions found in other guides. The What's Happening page has artists, performers and sponsors personally telling you what they are presenting NOW, along with ads for events. The calendar displays as a month, week, day or agenda. Each event is categorized (e.g., music, art), and you can choose to view any or all of the categories by clicking on them in the dropboxes at the top of the calendar. Through April 22 - Winyah Rivers Foundation's 2016 Photography Contest. Categories include Georgetown County, Scenic, Wildlife and Cell Phone with awards for Best of Show, 1st, 2nd & 3rd per category, and People's Choice. Awards ceremony, May 6. For rules and how to enter, 843-349-4007 or winyahrivers.org. Through April 24 - Sandy Scott: A Retrospective at Brookgreen Gardens is a major traveling museum exhibition, comprised of 45 or more sculptures and 35 etchings and drawings. Sandy Scott received her formal art training at the Kansas City Art Institute and later worked as an animation background artist for the motion picture industry. She turned her attention to etchings and printmaking in the 1970's and to sculpture in the 1980's. Sandy Scott is on the teaching staff of the Scottsdale Artists' School, and the master sculpture workshops at Brookgreen Gardens. She is a member of The National Arts Club New York, NY, the Society of Animal Artists, a fellow in the American Artists Professional League, and a fellow of the National Sculpture Society. Daily, 9:30 AM-5 PM, exhibit free with admission, 843-235-6000 or Brookgreen.org. Through Sept. 5 - Nature Connects Art. Brookgreen Gardens will host 12 larger-than-life LEGO® brick sculpture installations in its Native Wildlife Zoo. Created by Sean Kenney, renowned artist and children's author, "Nature Connects" is an award winning exhibit currently touring the country. Made from almost a half million LEGO® bricks, the sculptures bring nature to life with a 6-foot tall hummingbird hovering over a trumpet flower, a deer family made from 48,000 bricks, a giant tortoise, a 7-foot long giant dragonfly, and more. Daily, 9:30 AM-8 PM (in April), until 5 PM (May-Sept.), free with garden admission, 843-235-6000. Calling All Artists - Save the date for the 4th Annual Seaside Palette en Plein Air which will be held Saturday, Sept. 24, 2016. It is once again the kick off event for the Pawleys Island Festival of Music and Art. This year the Seaside Palette will be a one-day event with judging and cash prizes awarded on Saturday. Please check the Pawleys Island Festival of Music and Art website (www.pawleysmusic.com) for additional information including the application and instructions for the event.